Umm ... Korean food? I thought I was in for a Japanese AYCE with Korean BBQ options but I guess they chose to emphasize the Korean. 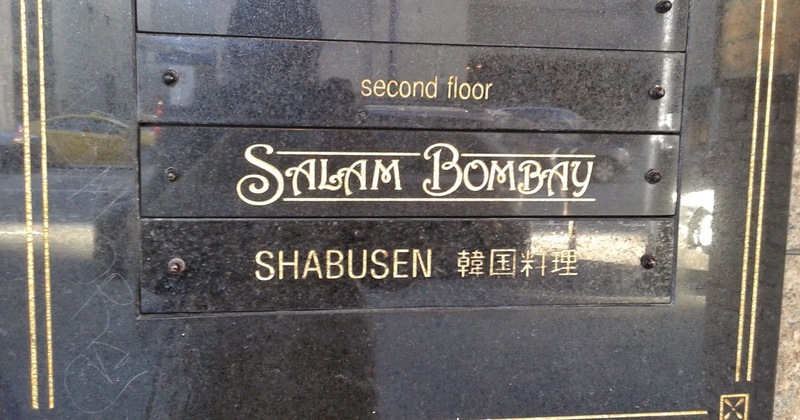 As if two nations were not enough, there is a third nation represented by the restaurant - it is Chinese-run. As I expected, the restaurant had a very large dining space, but to my surprise, there was also a very large line-up. Fortunately, since I came by myself, I was able to bypass the line-up. The manager said I could sit at the bar, but unfortunately, the servers couldn't keep up and they forgot to hand me a menu until about 5 minutes later. Oh well, at least I still had an hour left before last call (2 p.m.). They really spent time and effort to make the seating arrangements interesting. 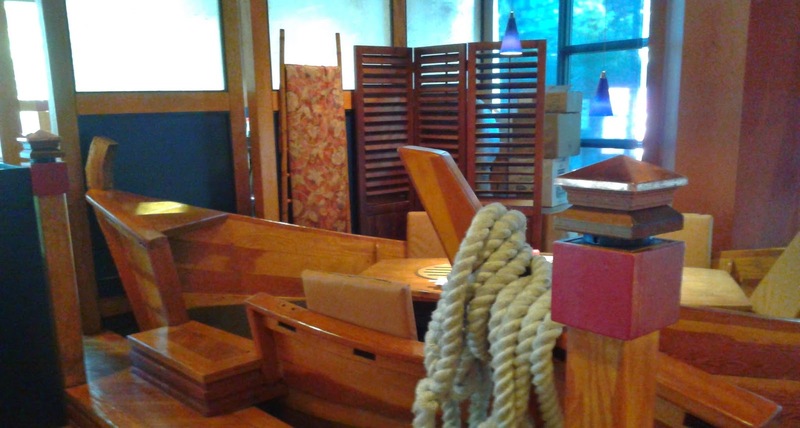 Some of the tables are in the form of large sushi boats! Most of the rolls were alright, and the sushi rice was soft enough and was only slightly mushy. The Prawn Tempura Roll was disappointing as it was completely prawnless. There is no prawn tempura on the lunch AYCE menu and here in the Prawn Tempura Roll, they could only afford to give me the tip of the batter. 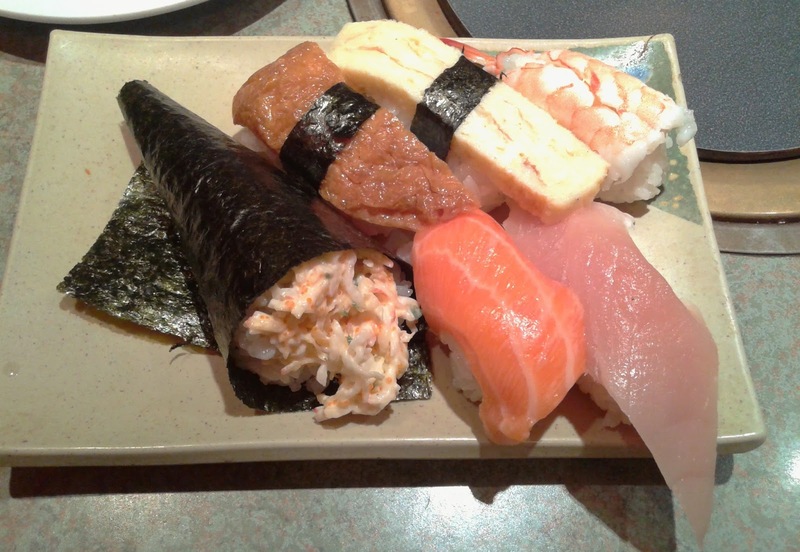 The California Roll was quite heavy on the rice, but had a sweet flavour and contained crab meat in both the ground form and the crab stick form. 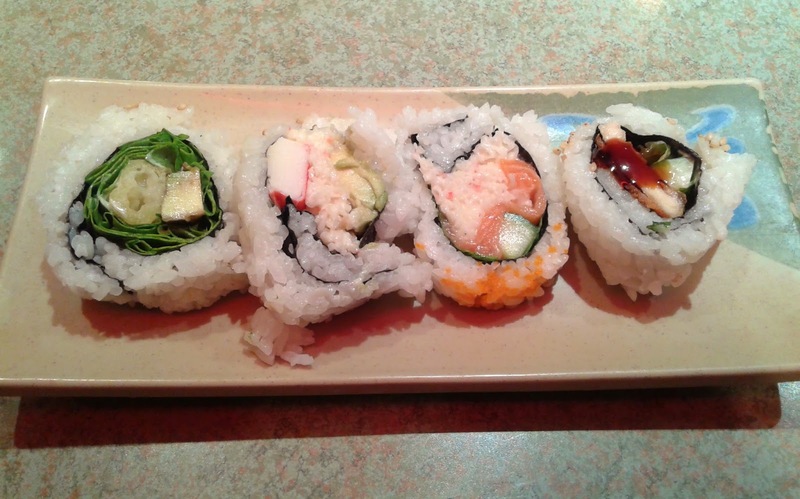 The Alaska roll had a good amount of salmon, but the crab meat could have a more prominent flavour. In the Teriyaki Chicken Roll, the sauce was tasty, but the chicken could be more tender. The Spicy Salmon Sashimi had a Japanese sweet chili sauce which had just the right amount of spice, not overwhelming the salmon. The Tuna Sashimi had a decent soft texture without being mushy and had a vibrant, but slightly metallic taste. 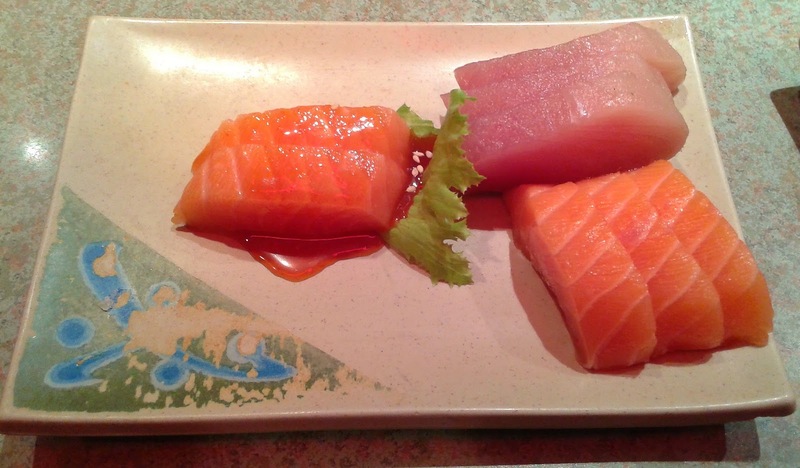 The Salmon Sashimi had an appetizing creamy, sweet flavour and was soft except the center. The crab meat in the Special Kani Cone (kani = crab) was almost devoid of any flavour and there wasn't that much crab in it either. 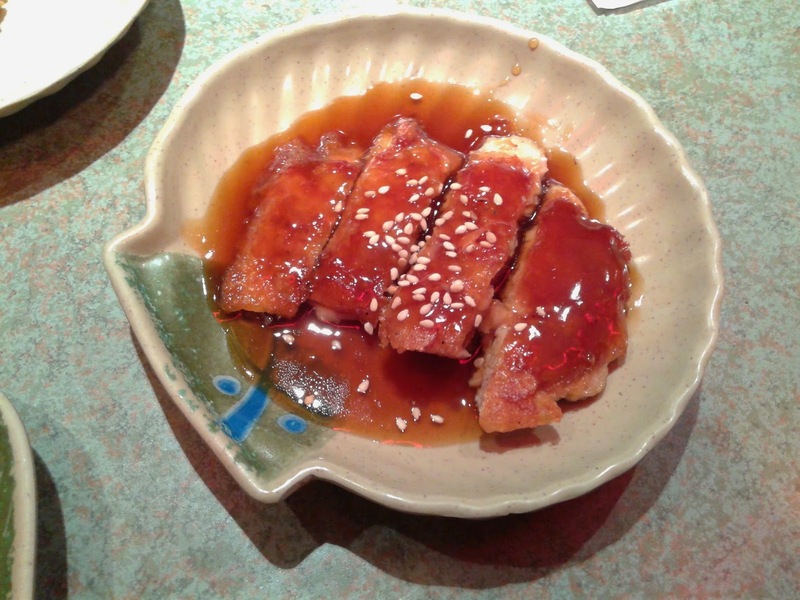 On the other hand, the thin layer of bean curd on the Inari Sushi was quite sweet and pleasant. The tamago (egg) on the Tamago Sushi was soft and had a prominent egg flavour (it was not as sweet as the average tamago sushi). The shrimp on the Ebi Sushi was unfortunately split in half and didn't offer much in terms of flavour. The Salmon Sushi had the same decent taste as the Salmon Sashimi, but here, it had a bit of a snap in terms of texture. The Tuna Sushi was rather strandy, unlike the Tuna Sashimi. 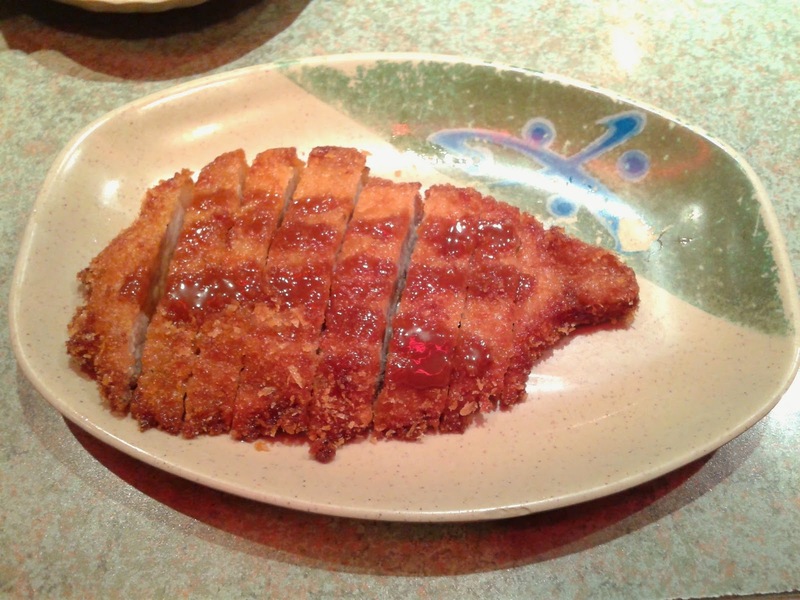 The Ton Katsu was fried with a panko batter and was quite crispy. The frying was just a little overdone, but it did the job. 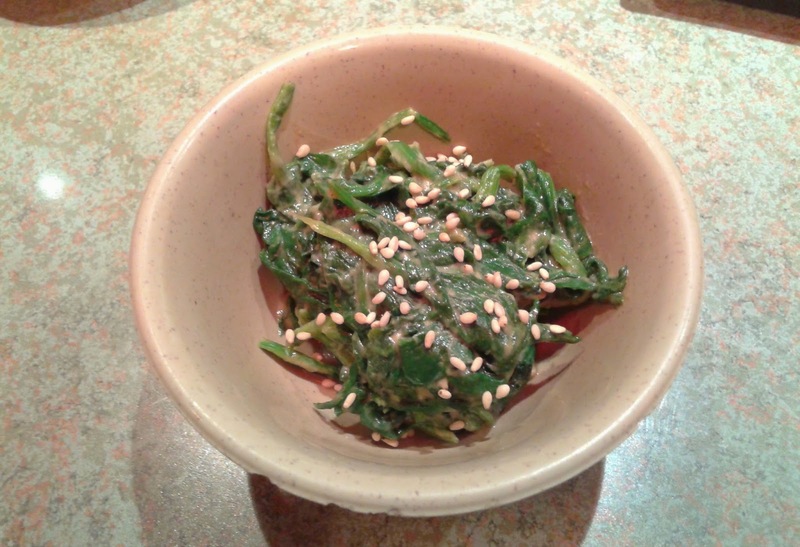 The Goma-ae was served chilled and the spinach was cut into small, easy-to-chew pieces. The sesame sauce and sesame seeds on top provided a well-balanced sweet taste and overall, I found the Goma-ae quite refreshing. The Chicken Teriyaki was tender and there was an abundance of teriyaki sauce. The crust was a little hard compared to the chicken meat itself. 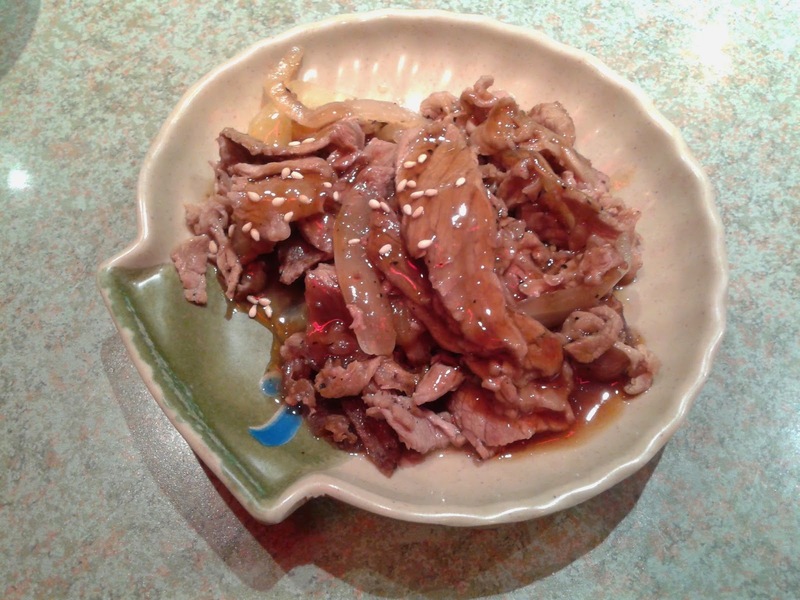 I enjoyed the Beef Teriyaki, which was cut into small pieces and accompanied by sliced onions and a savoury teriyaki sauce. There are some fatty parts here and there, but this was still one of the most well-executed items on the menu. The Vegetable Spring Roll had a filling that consisted of mainly lettuce, carrot and vermicelli. It reminded me of gyoza, but without the pork. Unfortunately, the crust was very hard and didn't look that appetizing either. 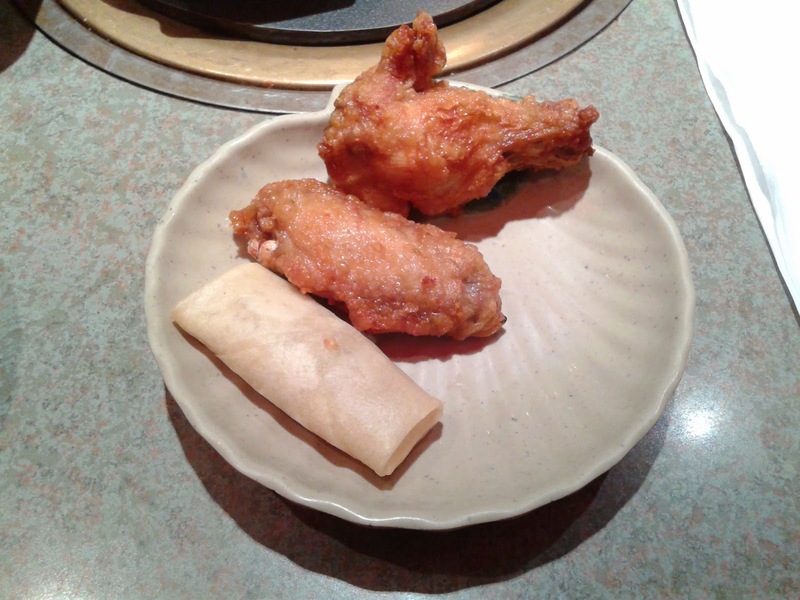 The Chicken Karrage (I ordered two pieces of it) came with a drumette and a wing and was much better than the chicken in the Chicken Teriyaki Roll. Both pieces were meaty and had enough moisture inside. 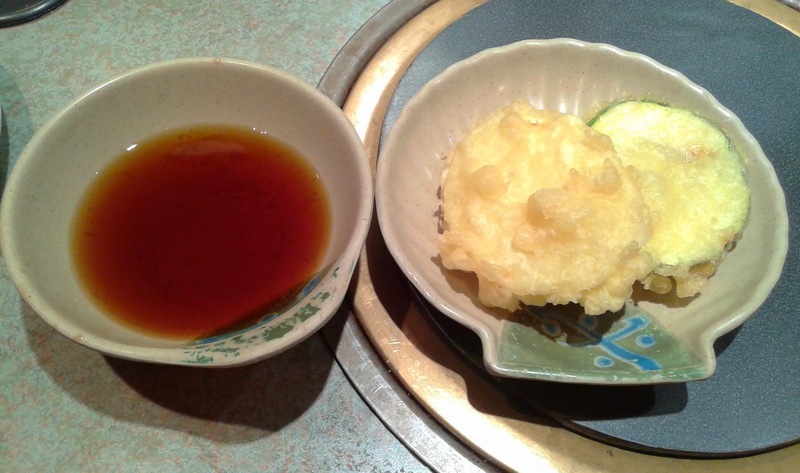 The tempura was presented with a nice light colour. The yam was sweet and was sliced rather thick, but there was a bit too much batter. The zucchini, on the other hand, had the right amount of batter and was very soft and juicy inside. After I finished everything above (in a jiffy to avoid overcrowding), I ordered the Korean Yakiniku BBQ which the restaurant is known for. It was time to have some fun with the mini grill! I ordered BBQ beef, BBQ chicken and BBQ pork chop, which all came in a bowl uncooked. 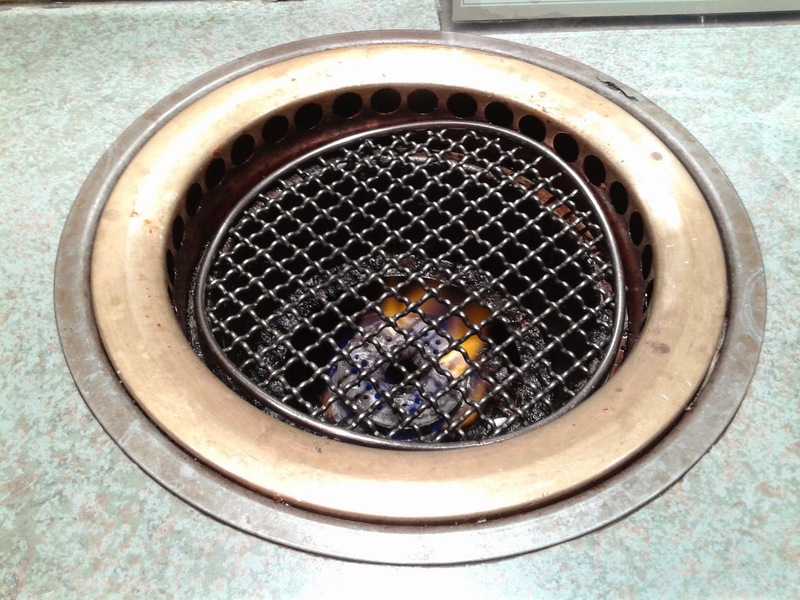 It was then that I realized the grill wasn't big enough to cook everything in the bowl at once. In fact, I spent almost an hour grilling my food in multiple rounds! It looks like I should have included the Yakiniku BBQ items in my initial order instead of my last order. Oh well, there is nothing more fun than sitting there waiting for your food to grill while smelling that BBQ aroma, right? I know the ratings are a little dependent on my own grilling skills, but in any case, it is a shame not to order the Yakiniku BBQ at Shabusen. 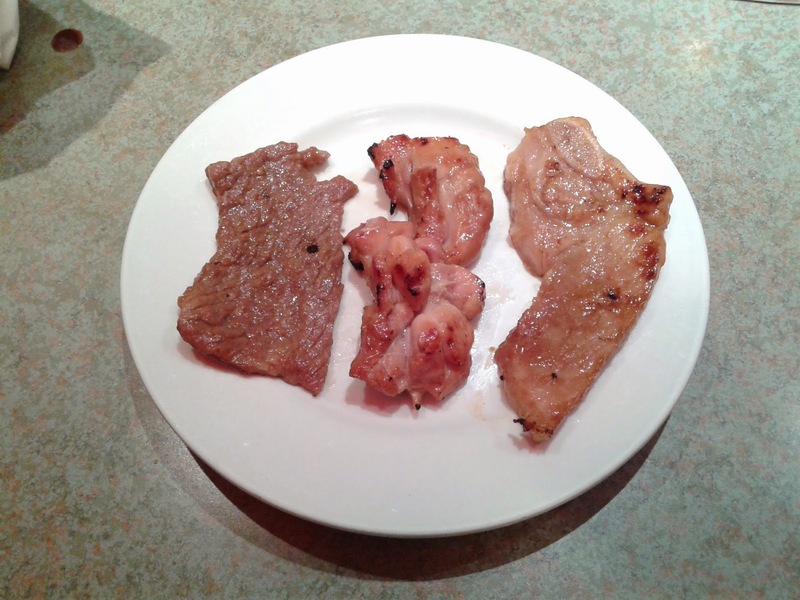 The Yakiniku BBQ tastes a lot like teppanyaki and has a modest but distinct sweet flavour. I liked how the beef was sliced into thin slices to minimize the cooking time necessary, though I wish the same could be said for the chicken. Some of the pieces of chicken took upwards of 15 minutes to fully cook, but at least the end results were rewarding.